CHEYENNE, Wyo. (AP) — If you ever wished to gaze at a stomping, snorting, neighing panorama of Western heritage from your living-room window, now could be your chance. A classic image of the American West — wild horses stampeding across the landscape — not only has endured through the years but has multiplied past the point of range damage. Through May 3, the U.S. government is seeking more private pastures for an overpopulation of wild horses. Many consider rounding up wild horses to live out their lives on private pastures a reasonable approach to a tricky problem. 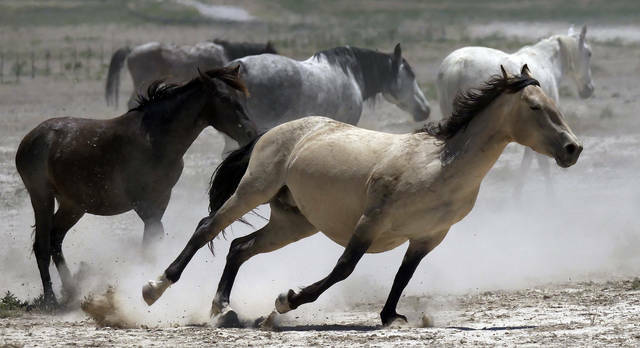 Wild horses, after all, not only have romantic value, they are protected by federal law. Just keep in mind a few of the dozens of requirements for getting paid by the government to provide wild horses a home. “It’s not like you can do this in your backyard, or even a 5 acre (2 hectare) plot,” said Debbie Collins, outreach specialist for the U.S. Bureau of Land Management’s Wild Horse and Burro Program in Norman, Oklahoma. You need a lot of fenced-in land, enough to sustain anywhere from 200 to 5,000 healthy horses. Exactly how much land depends on pasture quality as determined by the government, but you can safely assume several hundred if not thousands of acres (hectares). Participants in the private-pasture system must live in 14 Western and Midwestern states, from eastern Washington to the Texas Panhandle. Over two-thirds of the 37 existing off-range pastures are in Oklahoma and Kansas. And: These horses aren’t pets. They’ve had little exposure to people. Many are over 5 years old and therefore not ideal for training and individual adoption or sale, other options available through the BLM. Still, there’s no shortage of interest in the off-range pasture program. People call all the time asking for details, Collins said. “My only advice would be to go into it with your eyes wide open,” said Dwayne Oldham, a former Wyoming state veterinarian who has taken in wild horses on his family’s Double D cattle ranch outside Lander, Wyoming, since 2015. Working with the government can be demanding, but providing for the over 130 horses on the Wind River Wild Horse Sanctuary on the ranch isn’t too difficult, Oldham said. The sanctuary is a little different from most private wild-horse pastures: It’s open to the public. Tourists headed to Yellowstone and Grand Teton national parks increasingly stop there. About 50 miles (80 kilometers) to the south, cattle ranchers, wild horse advocates and the BLM have been embroiled in decades of lawsuits over wild horses in an area of mostly unfenced, interspersed public and private lands called the Checkerboard. The booming wild horse population there competes with cattle for forage and water in the high desert, the ranchers claim. The BLM abides by the 1971 Wild and Free-Roaming Horses and Burros Act, which protects wild horses and burros on BLM land in 10 Western states, attorneys for the government say. “We want to be part of the solution and not just the adversary,” Oldham said. 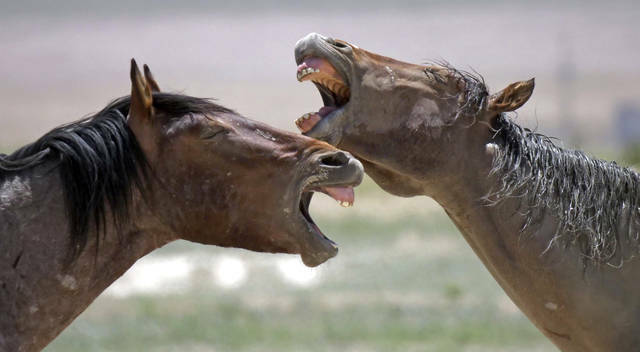 A group often involved in wild-horse litigation, the American Wild Horse Campaign, says darting mares with contraceptives is the best answer to overpopulation but is underused. Roundups only encourage compensatory breeding and overpopulation, said Grace Kuhn with the group. However, the group doesn’t oppose off-range pastures as an alternative to keeping wild horses in corrals for long periods. 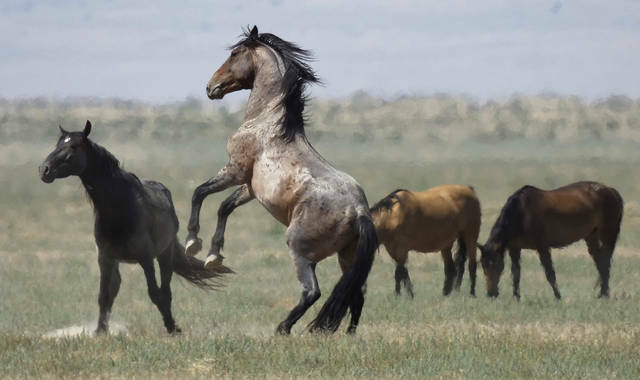 “We do advocate that if the government is going to be removing wild horses from the range, long-term is more cost-effective than short-term holding,” Kuhn said. Over 55,000 more horses and burros live wild in the West than the roughly 27,000 the BLM says can thrive in harmony with the landscape. Adoptions and sales through the Wild Horse and Burro Program have recovered to over 3,400 a year after hitting a low of about 1,800 in 2014. But while the number of off-range pastures has boomed from just a couple in the 1990s, the number of horses on them hovers very close to their current carrying capacity of about 36,500. The number of pastured wild horses is determined mainly through roundups and adoptions. Stallions are gelded and kept at different off-range pastures than mares, preventing reproduction aside from the occasional pregnant mare rounded up from the wild. How many new off-range pastures are established through the latest bid solicitation, the first of its kind since 2016, will depend on costs and how many existing ones get renewed, Collins said. “It’s just a happier, healthier environment for a horse to be able to be out in a pasture,” she said. Disclosure statement: Prior to my retirement in late 2016, John Delano received research funding from NASA. No current funding. John Delano is currently a volunteer interpreter at three sites in Colonial Williamsburg, VA.
Partners: University at Albany, State University of New York provides funding as a founding partner of The Conversation US. But now my work on 726 miles of stone walls provides an independent check on magnetic declination between 1685 and 1910.